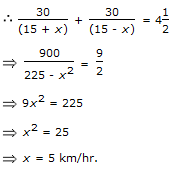 Explanation: Speed downstream = (13 + 4) km/hr = 17 km/hr. Time taken to travel 68 km downstream = 68/17 hrs = 4 hrs. 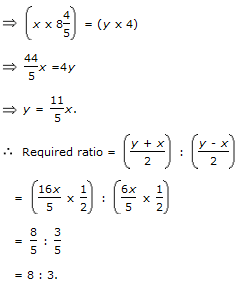 Explanation: Man's rate in still water = (15 - 2.5) km/hr = 12.5 km/hr. Explanation: Let the man's rate upstream be x kmph and that downstream be y kmph. Explanation: Speed in still water = 1/2x(11 + 5) kmph = 8 kmph.